Nami Island, the location where the popular drama series - Winter Sonata was filmed, is now a popular destination for both the Koreans and tourists. Yes, the drama series had been aired some 10years ago, but the island still maintains a distinct and well-kept charm. We were very fortunate that our Korean friend, Romeo and girlfriend drove us to Nami Island. Otherwise, we would spend about 2hours searching for our way to the island. For information on how to get there, details are available on Nami Island website. I would definitely recommend allocating an entire day for Nami Island. You take about 1.5 - 2 hours getting there, and back from Seoul respectively. The island is not too big, but you would still need to spend at least 3-4 hours strolling around the island. Admission to Nami Island is from Gapyeong Jetty (Nami Island Jetty). Otherwise, one can also try the Zipwire where you zip down 940m across the river from a 80m tall tower. We are not that adventurous, so we went by the traditional way, by taking the ferry. The ferry that we took, was a unique submarine-like looking vehicle displaying the flags from countries over the world. We were greeted with numerous excited photo-spots as we step into the beautiful and rustic island. Visitors could rent a bicycle to cycle around the island. As this was our very first trip, we decided to explore by foot slowly on foot. We didn't manage to cover the entire island as the island is not that tiny afterall! We were too tired and the sky was getting dark (the sun starts to set about 5+pm during the Autumn) by then. We definitely recommend renting bicycles so that more grounds could be covered. Stone figures of fat man and woman in different pose are found thoughout the island. Some depicting the love of a mother, whereas others might look a little offensive! Here comes the highlight of the Island. 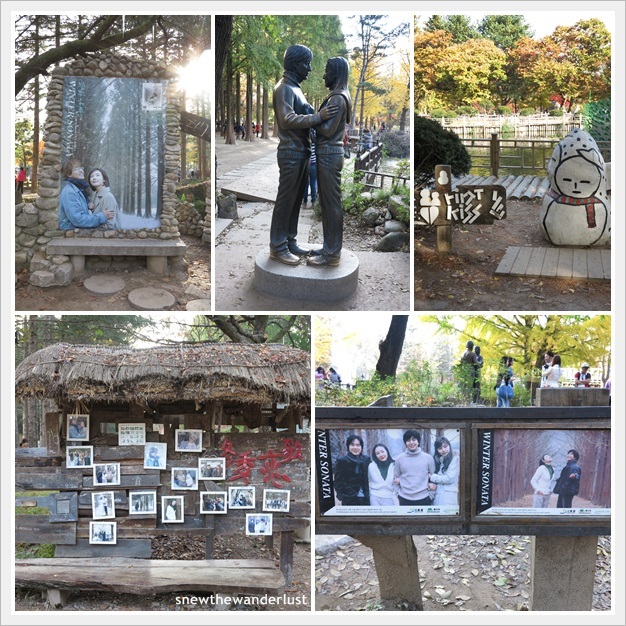 In almost every corner, we are reminded of the Winter Sonata drama series. From the place of their first kiss, to the signature poster shot of the couple, with rows of trees neatly lined behind them. It was indeed a real challenge trying to get the a good shot amidst crowds of people. This was the peak period to Nami Island as everyone as flocking there for the Autumn trees. 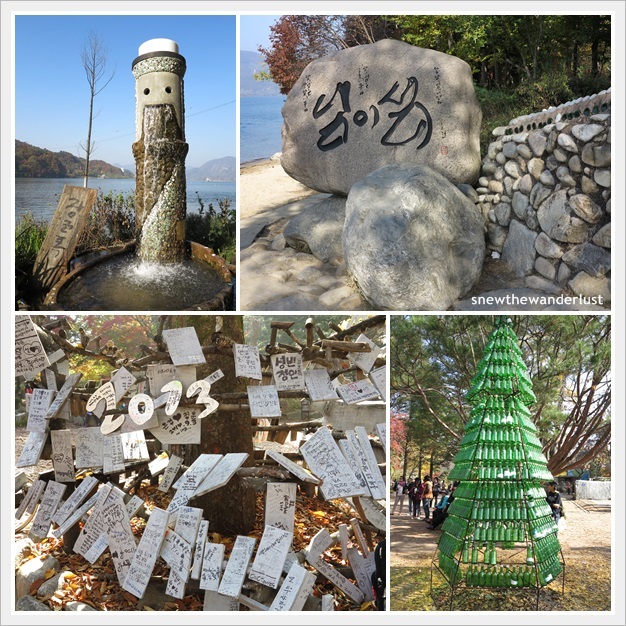 Nami Island, a romantic place for couples? How romantic could it be with tons of visitors fighting for a spot to take that signature photo? Doesn't my friend, Romeo just look like a Korean movie-star? We didn't manage to cover the entire Nami Island as we were already tired out by the photo-taking and walking. There is a hotel in the island for visitors who would love to spend a bit more time exploring the island. There was a very long queue for the ferry on the return trip as most visitors were leaving the island at that time (around 5pm). Thankfully, the queue was cleared pretty fast. The journey back to Seoul was met with a heavy traffic. We spent almost 4 hours on the road. But, being there for the first time. It's all worth-it. Very pretty pictures you have captured there!! 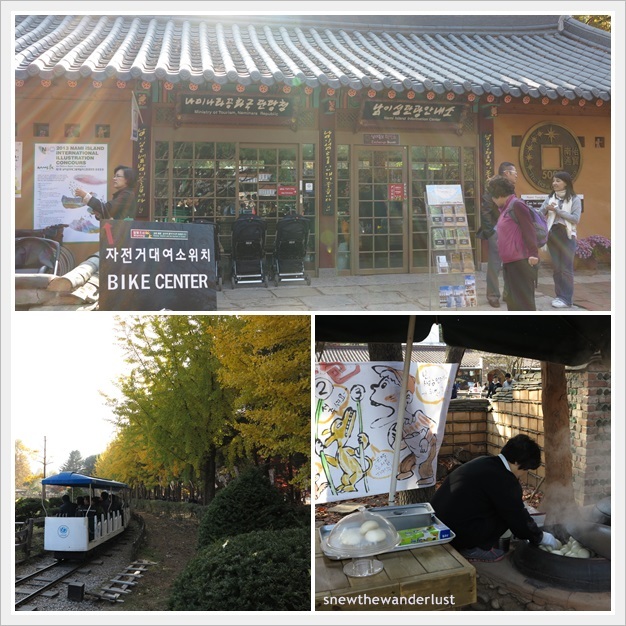 If I'm not wrong, I was was at Nami Island on 26 Oct 12. But the dates for autumn leaves changes every year, so I suggest you check online or from taiwan tourism board when you are planning to go. Thanks! Yeah will check it out.